May 31, 2018 | By CENS | SUPERMAN MOTOR INDUSTRIAL LTD. Ever since founded in 1988, Superman Motor Industrial Ltd. has been engaged in supplying and exporting auto parts and accessories mainly for the aftermarket (AM) segment. 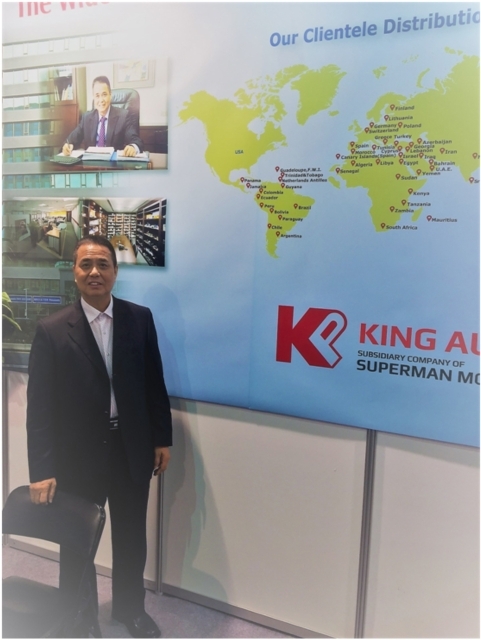 At this year's Taipei AMPA and AutoTronics Taipei, held April 11-14, Superman Motor was not eclipsed by any of its counterparts at home and from abroad, thanks to its relatively comprehensive product lineup coupled with devotion to customer satisfaction, which has earned the company a solid reputation as a trustworthy partner in the line. Chairman David Hsieh of Superman Motor stressed at the venue that the company focuses on spare parts and accessories for Japanese and Korean cars, with product lineup encompassing nearly every item that is needed in the market segment, which is categorized into body parts, suspension parts, brake parts, steering parts, engine parts and more. All its products are made in Taiwan and under strict quality control that has passed ISO certification. The chairman mentioned that Superman Motor has built robust presence worldwide, especially in Central and South America and Africa, where average ages of cars on roads are higher than those in other regional markets. He indicated that such a market characteristic results in considerable demands for AM parts and accessories there, and the company's ability to fill contract orders for varied items in low quantities is particularly appealing to local customers. In response to the ever-changing global market for auto parts and accessories, Superman Motor puts heavy emphasis on maintaining positive relationships with subcontractors, in an effort to ensure a constant supply of newer products from them, while continuing to inform customers of the latest product offerings every month. At present, the supplier's available product list that is accessible on its website consists of over 100,000 different items and is periodically expanded. Superman Motor`s chairman David Hsieh in a black suit and neat shirt was interviewed by CENS at this year Taipei AMPA.